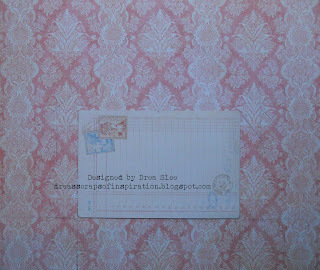 Drea here with a tutorial featuring the gorgeous Graphic 45 Gilded Lily I Want It All Bundle from FotoBella! 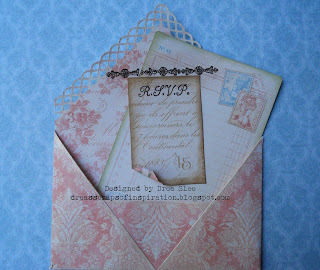 I imagined getting a fancy invitation, which inspired this project using a punched envelope and some embossing powders. 1. 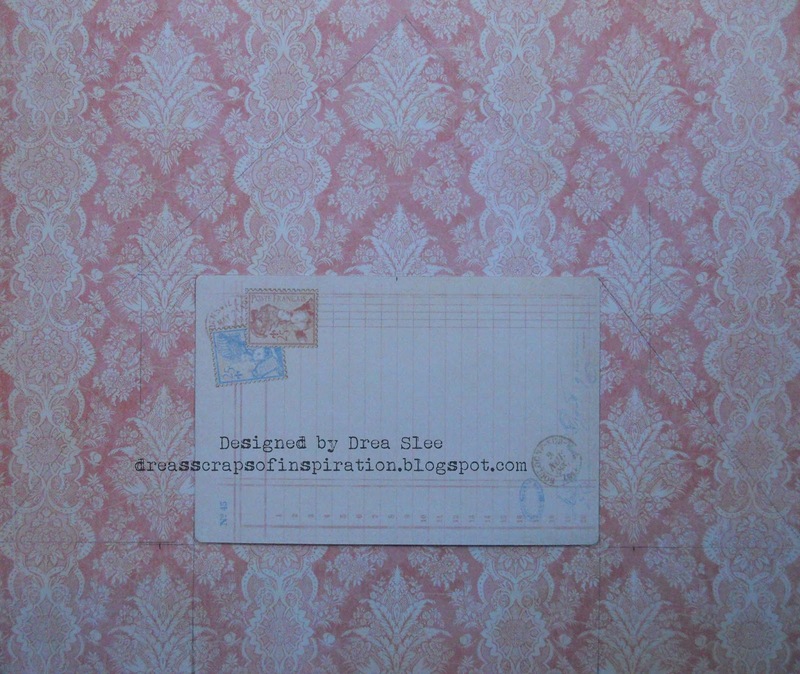 To create the envelope, center one of the larger Ephemera Cards onto the Golden Age paper, and trace around it with a pencil, leaving 2 - 3" along the bottom. 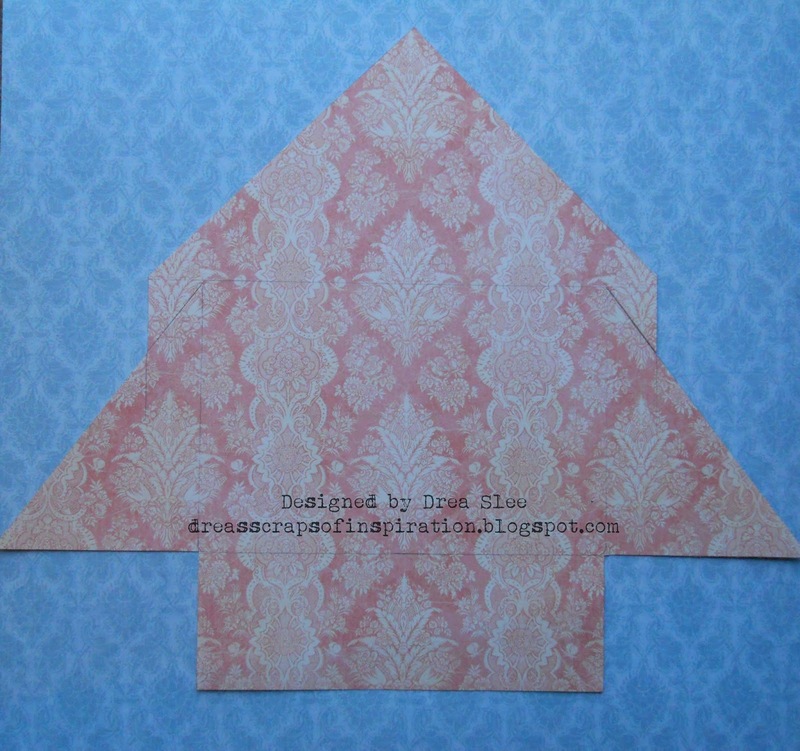 Create side flaps by extending the line along the bottom to the edge of your paper, leaving 3" on each side. Then draw a triangle from the top edge to the ends. 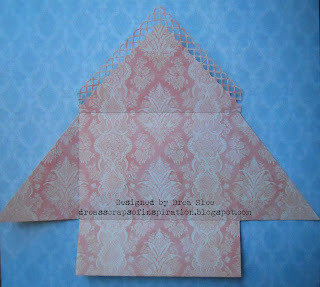 Draw another triangle on top, extending your lines about an inch, so you can punch it later, when making the flap. 2. Cut out your pattern so that it looks like this. 3. Use your corner punch along the center of your flap, and continue punching with your border punch. Use a stylus to create your folds, and trim excess punchwork along the edges of the flap. Apply the Paint Dabber around all of the edges, including the punchwork. 4. 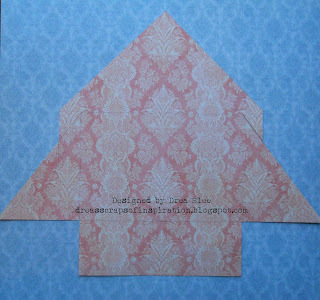 Fold and glue your envelope together. 5. To make the "invitation" I used my blending tool with Distress Ink (Bundled Sage) around the Ephemera Card. Then I used Frayed Burlap around the scripted paper, which I cut the same width as the little envelope from the Tags & Pockets. 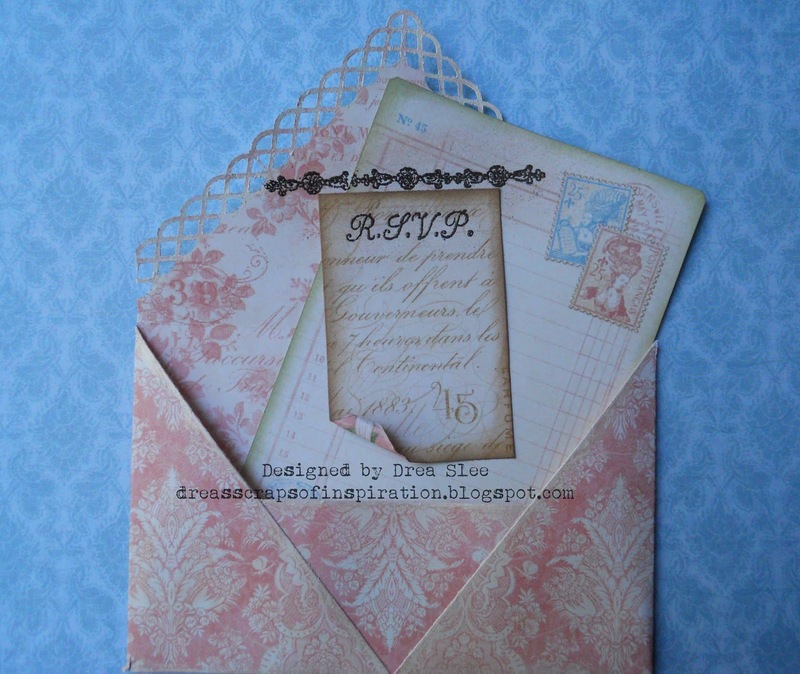 I embossed the top of the scroll and RSVP with Lindy's Stamp Gang Embossing Powder (Twilight Bronze Slate) using the Gilded Lily 1 Cling Stamp, which I also used for the address on the little envelope. 6. 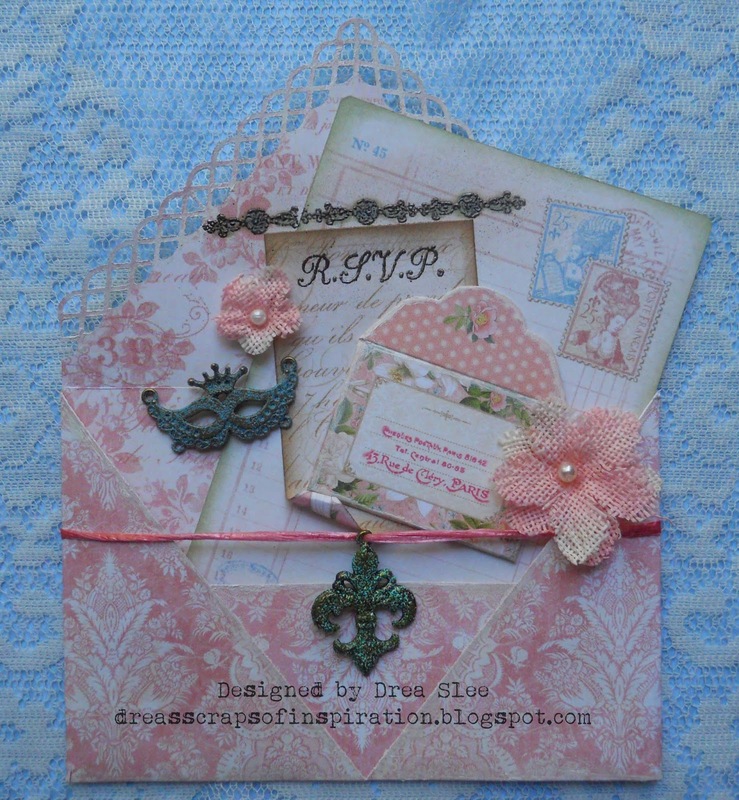 I just LOVE the Vintage Charms, which have been hand-selected exclusively by FotoBella, and used a couple on here with some embossing powders, for color and texture! For the mask, I used Ranger Distress Embossing Powder (Broken China). 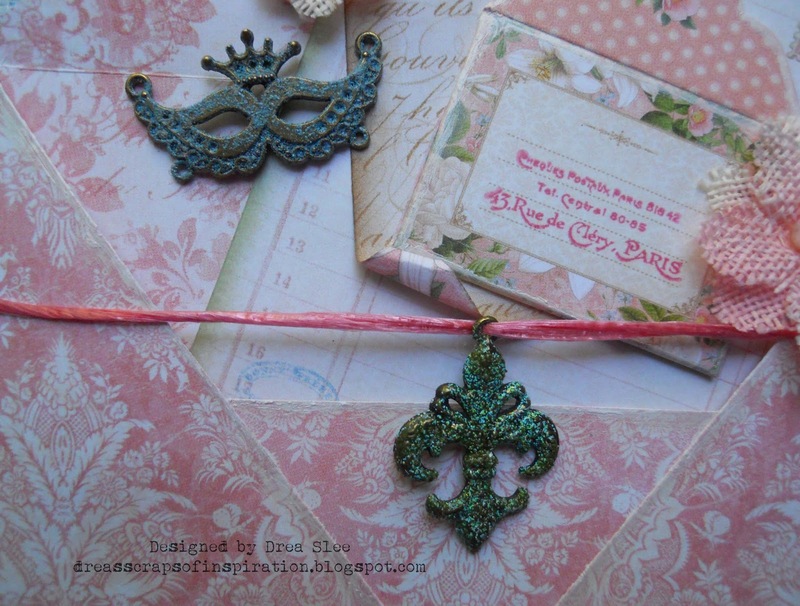 For the fleur de lis, I used Ranger Verdigris and Distress Embossing Powder (Peeled Paint), and strung it through some pink ribbon that I had on hand. 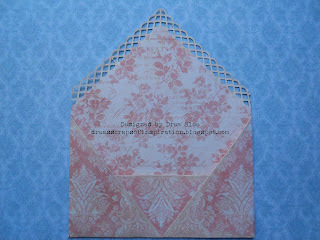 I finished it up with a couple of pink Petaloo Mini Burlap flowers. Beautiful and thanks for sharing the instructions.